On our first night in Athens, our cab driver went out of his way and took us to the top of Mt. Lycabettus at no extra charge. The hill is called the Balcony of Athens for its breathtaking view of the Acropolis, overlooking the city. “Gosh, is this even real?” Vins whispered in jest and in awe. In jest because this stop was never part of our plan. I don’t even know why we let our driver, a complete stranger, take us there barely an hour into this trip. In awe because as we stood there, a strong feeling of disbelief enveloped us. We just couldn’t believe we were there. That feeling has been quite familiar to us. It was also there when we were admiring the surreal landscapes of China, the atolls of the Maldives, the vast expanse of Australia, and the celebrated landmarks of Europe. And all these were made possible by the rise of low-cost carriers. Over the past several years, low-cost carriers have made many destinations more accessible to more people. One of them is Scoot! This Singapore-based airline has connected cities in Asia to over 60 other cities, including key destinations in Europe and Australia. And they’re just getting started. These days, Scoot is determined to change the perception that cheap fares means compromising on comfort. In fact, when we flew from Athens back to Singapore, just before exiting, the passengers gave the staff applause not just for the safe, smooth flight but for the attentive service. Sure, I’ve seen that sort of display of appreciation happen before, but this was the first time I saw it on board a low-cost flight. It was a great thing to witness. And well-deserved, too! Still, many travelers (especially first-time fliers) are still at a lost when it comes to scoring affordable fares. We got in touch with our contacts at Scoot and asked them to share some insider tips not just on snagging cheap fares but also making your Scoot journey more comfortable. 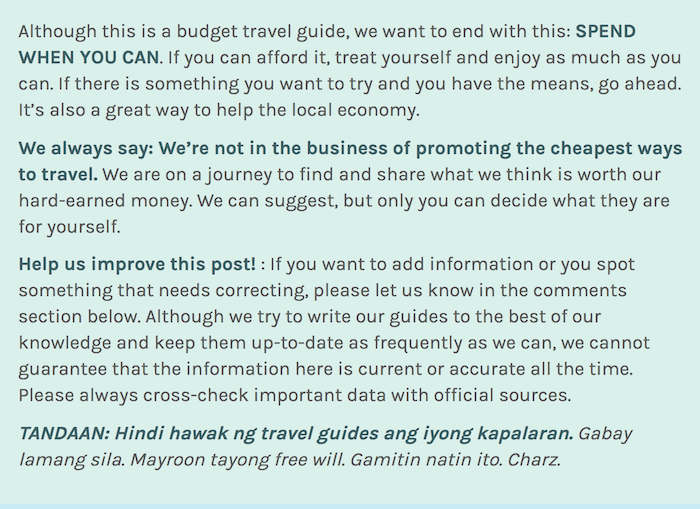 I used to work for an airline in my pre-blogging past life (LOL), and one thing that budget travelers need to understand when trying to score cheap flights is the pricing system. You see, not all seats on a plane are priced the same. Some are cheaper than others. And I’m not talking about business class vs economy class. Even within economy class, the price of the seats can vary greatly. By default, the system displays the cheapest year-round fares first so they sell out first. That’s why often the closer your travel date is, the more expensive the flight gets. But does that mean that you have to book really early to score the lowest fares? Hmmm. Not really. There’s some truth to it, but not quite. Of course, in addition, the airline can choose to bring down the cost any time of the year when they’re running a promotion. Some budget travel experts say that if you want to snag low fares, search for flights on Wednesdays, just after midnight. According to our airline contacts, however, that is not true at all. Booking on Wednesday does not guarantee or increase likelihood of finding cheaper flights. But booking a Wednesday flight probably will because in general mid-week flights are cheaper than weekend flights. However, flights scheduled on public holidays, regardless of what day of the week they fall, are generally pricier. There is such a thing as a “blackout period,” which usually covers the week before and after a major holiday. This because of dynamic pricing. What it does, in a nutshell, is cause the prices to readjust according to many factors including demand. If two major celebrations are happening on consecutive days, especially if they fall next to a weekend, that’s a peak period too. Wednesday may not be as magical as some people think, but when it comes to Scoot, Tuesday is the gift that keeps on giving. And it’s not just a rumor or a myth. Each month, Scoot has a so-called Take Off Tuesday promotion, which is a 3-day sale starting from the first Tuesday of the month, when they offer discounted airfares to some of their destinations including Athens and Berlin (although certain flights and dates may not enjoy the discount). This is great if you have flexible travel dates! Interested? Coincidentally, Scoot’s latest Take-off Tuesday promotion is out today and will run until Thursday (6 Sep)! Here are samples of the fares! ✅ Click here to see more discounted fares for your next vacation! If you want to be the first to know about low fares or when flights have become available for new destinations, sign up as a Scoot insider and get notified about the latest news and promos. Not only that, you also get a 15% OFF Welcome Voucher immediately after registering. 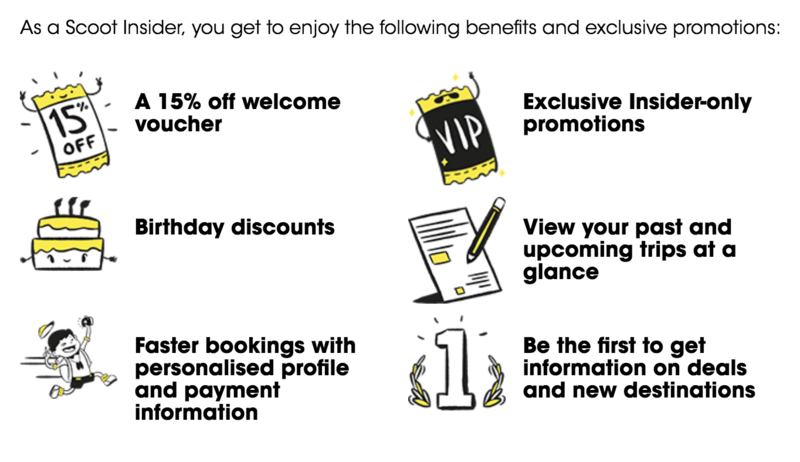 Plus, you’ll also receive a Birthday Voucher. A thoughtful touch! Another great thing about having an Insider account is that it allows you to book faster because you don’t have to enter personal details. This is critical when there is a massive sale or when multiple users are trying to book the same flight and seats are limited! One criticism that low-cost carriers usually get is that by default the published rates only cover the fare and you have to pay for anything you want to add. But that’s because some of us are just so used to legacy airlines’ set up wherein customers are charged for everything, even for those you won’t get to use. If your flight takes less than an hour, don’t pre-order a meal or snack if you don’t want it. Heaven knows how many meals I declined onboard full-service flights because I wasn’t hungry. If you plan to just sleep the entire flight (like I always do), why cover the fee for inflight entertainment or wifi? Same with baggage fees. I usually don’t check in bags for my outgoing flight. (Pack light!) But when I know I’d do a bit of shopping for souvenirs or pasalubong, I book a check-in baggage allowance (FLYBAG bundle) for my return flight. 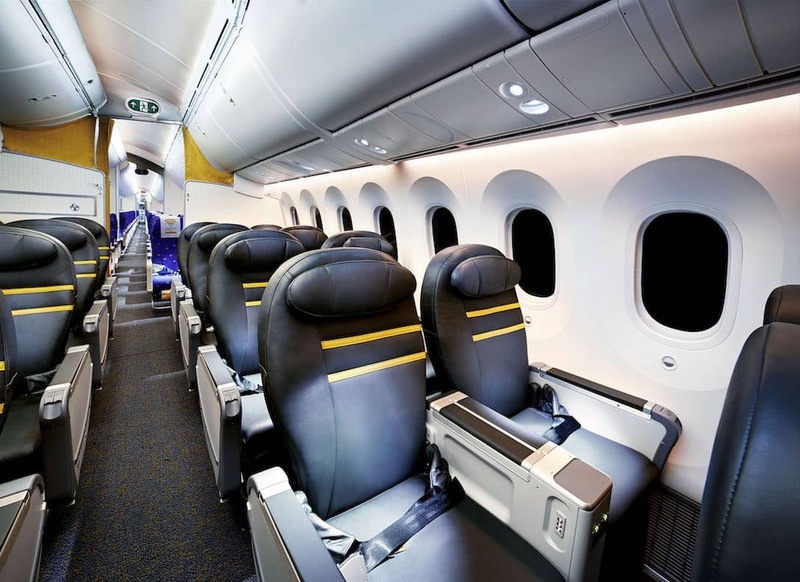 For flights using the Boeing 787 aircraft, Scoot has this so-called Bid4Biz, a feature that will allow you to bid for unreserved seats on Business class. You bid your price so you know it’s something you can afford and are comfortable with. If you make the best bid and it’s approved, they will let you know the day before the flight schedule. 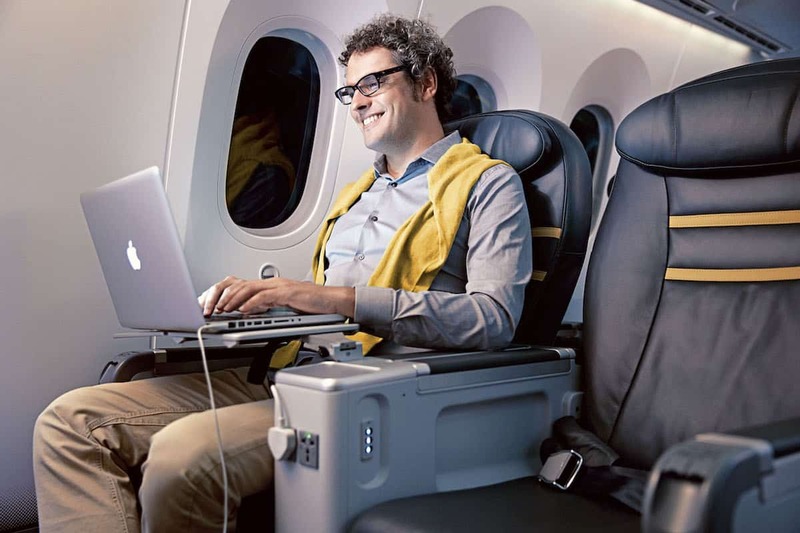 It’s a great way to score Business Class seats and enjoy all the perks that come with it like much wider legroom, 30kg check-in baggage, 2 hand-carried bags (carry-on) of up to 15kg each, and priority check-in and boarding. By scoring cheap but comfortable flights, you’ll have more money and energy to spend when you’re already there in your destination, which means you get to make more epic memories! To search for affordable flights or learn more info about Scoot, visit www.flyscoot.com. Next PostNext How to Book CHEAP FLIGHTS to EUROPE, MALDIVES and More with Scoot!